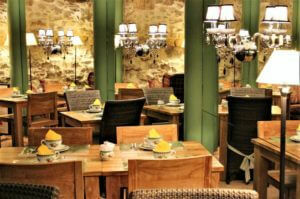 The Hotel Price de Conti is situated in the heart of Saint-Germain des Prés on the left bank. 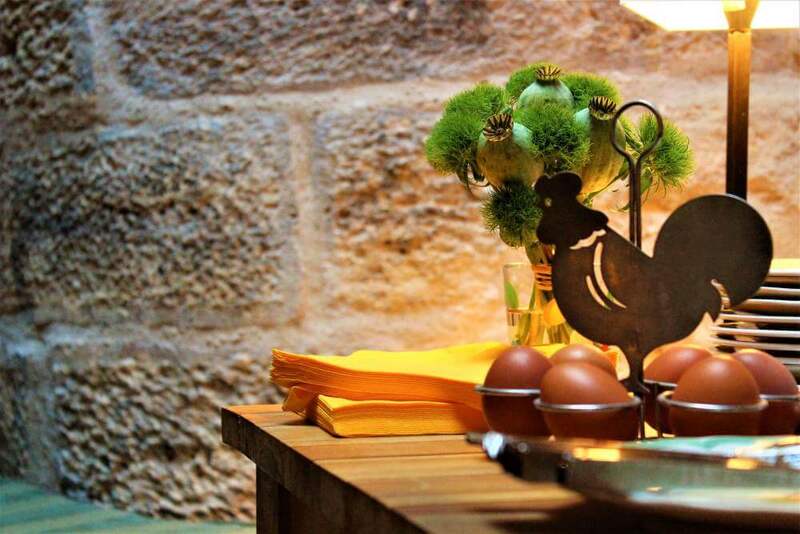 It is in a wonderful 18th century building with six floors (with an elevator) and a charming interior courtyard. We are proud to present to you the Hotel Prince de Conti renovated. The hotel offers a fantastic pallet of new and edgy designs. From Le Corbusier spirit to the French tradition of tribal and ethnic art’s collection, discover the new bright and chic French flair at the Prince de Conti! All the classics revisited and uplifted to enjoy Paris in its very heart. The unique location and most modern designs make of the Prince de Conti a must-see place for your next trip to Paris. HotelsT is a family business regrouping six hotels, five in Paris and one in Siena. Our concept is based on a unique equilibrium between design and boutique hotels. We offer a friendly, cozy and creative atmosphere in a refined and detailed ensemble. Old stone walls, wood floors, intimate salons with fireplaces, diverse and rich artwork in a modern design setting; these are just some of the attributes to describe the warm and inviting atmosphere of our hotels. Our hotels display a wide range of extraordinary objects and art pieces from all around the world. The hotels’ collection is constantly replenished with a modern twist. Our philosophy is to offer a personalized experience, an intellectual voyage and a call to each one’s curiosity with exceptional accommodation and service. We want to make our guests feel like they are home while they fully experience Paris. HotelsT happily organize themes packages on demand as well as full assistance right from the airport. 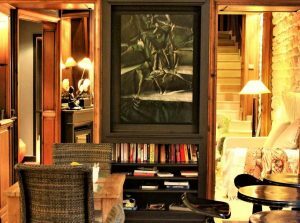 Their unique character coupled with their exceptional locations in the heart of the historical Paris (Saint-Germain des Prés and the 8th district) and in the heart of the old city of Siena make these hotels the perfect escapade that our guests will remember and share with their friends and family. The hotel reception is open all hours including nights to welcome you. Next to the reception is a small lounge area and many of our guests enjoy sitting here while waiting for a taxi or just reading from our wide selection of newspapers and magazines (French and international press). 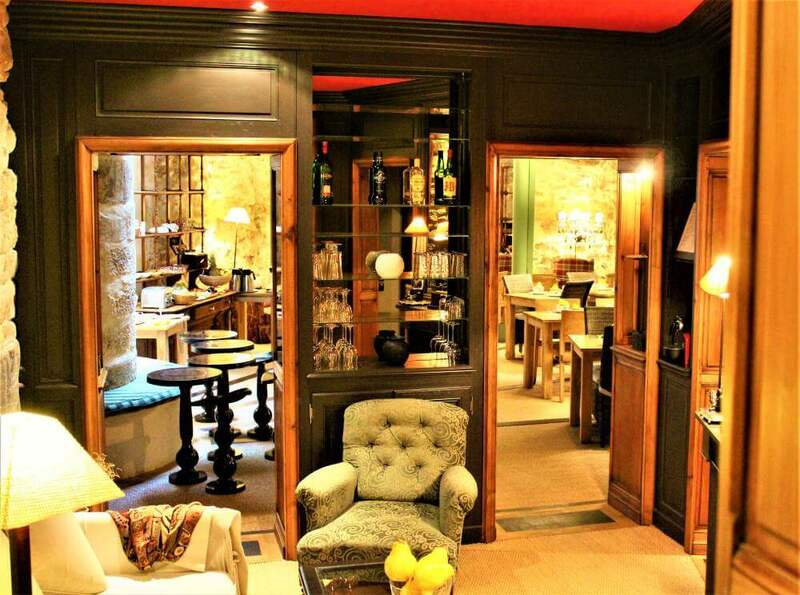 This cozy salon looks out over rue Guénégaud and has a collection of « curiosities ». 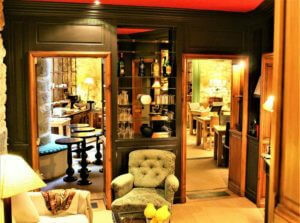 Many private homes in the past would have collections such as this housed in a precious antique « cabinet ». 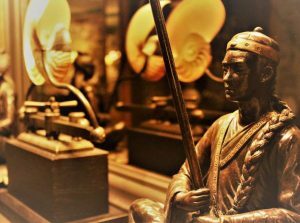 Sitting in your comfortable armchair, you will feel transported back in time and you are in a private home, surrounded by objects of beauty. One of these is a fine bronze sculpture of a dancer by the artist Catherine Masson. The traces of the sculptor’s tool can be seen, providing a feeling of vibrancy and freedom. In the winter, you will be drawn to the warmth coming from the 18th century white ceramic stove from the 18th century, tastefully modernized and electrified by Damien Spatara, a master craftsman from Alsace. • Infant/baby cot (according to availability) Please place your request a minimum of 48 hours in advance. All the staff at the Hotel Prince de Conti is available to assist you and help you organize your stay. Please do not hesitate to ask for advices and tips regarding museums, main tourist attractions (such as the Eiffel Tower, Notre Dame Cathedral, the Sacré-Cœur in Montmartre, the Louvre Museum, the Latin Quarter, Saint Germain etc.). 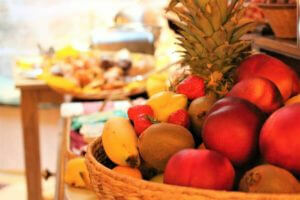 Breakfast is served from 7.30am to 11am (the price is 16€ per person, and free for children under 12 years of age) . You can have your breakfast in your room or in the elegant Breakfast Room on the lower ground floor that receives its natural light from a light well. This is, in fact, an ancient well and was part of the original stone wall that the King Philippe Auguste built at the beginning of the 13th century on the left bank, itself a continuation of a wall surrounding the city on the right bank dating back to the 12th century! How often does one get to touch something that is over 800 years old! Lights and mirrors have been put up to emphasize a feeling of light and space. There is a wide choice served in a buffet style. The Hotel Prince de Conti has an unusual feature – a Courtesy Bar in our salon is available for our guests to enjoy a moment of calm and conviviality in the center of Paris. 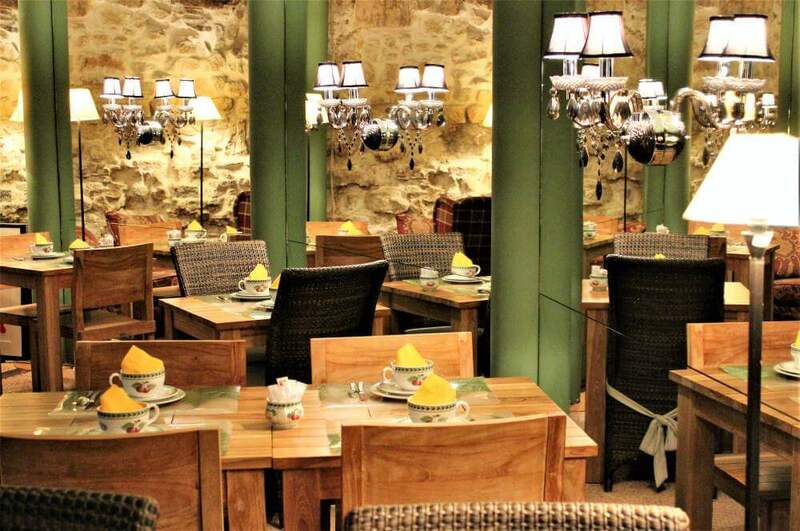 In a cozy hidden room with original stones walls dating back to the end of the 12th century, come and discover our Courtesy Bar. Enjoy a quiet refreshing drink, a glass of wine or a Nespresso coffee while you wait for your friends in our comfortable bar area with its electric fireplace. 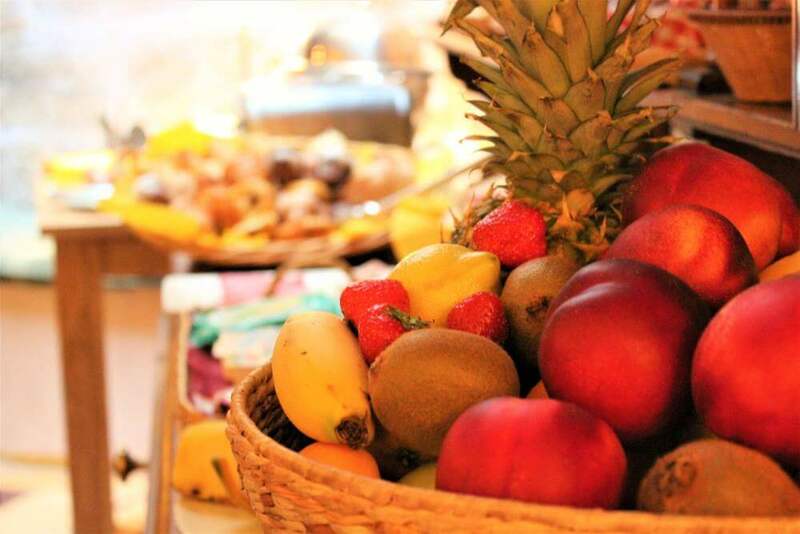 To really make you feel home from home in Paris, the Hotel Prince de Conti has a selection of refreshments freely available for our guests. A bar note book is left for you to note down your drinks at your discretion. This is the perfect way to unwind after a day of sightseeing or working in the office. It is also an enjoyable way to start the evening with an early drink before going out in Paris, « the city of light ». The discreet background choice of music in the bar is jazz or classical! The Hotel Prince de Conti is on the Rue Guénégaud, a quiet and small street between the Boulevard Saint-Germain and the river Seine, in a district known as La Monnaie. The rue Guénégaud was opened up in the 17th century on the site of the family home of the Prince de Conti. At the end of the road is The Monnaie de Paris (The Paris Mint) created in the year 864. It is an administration of the French state charged with issuing coins as well as producing medals. It houses a numismatics museum in its former foundry. 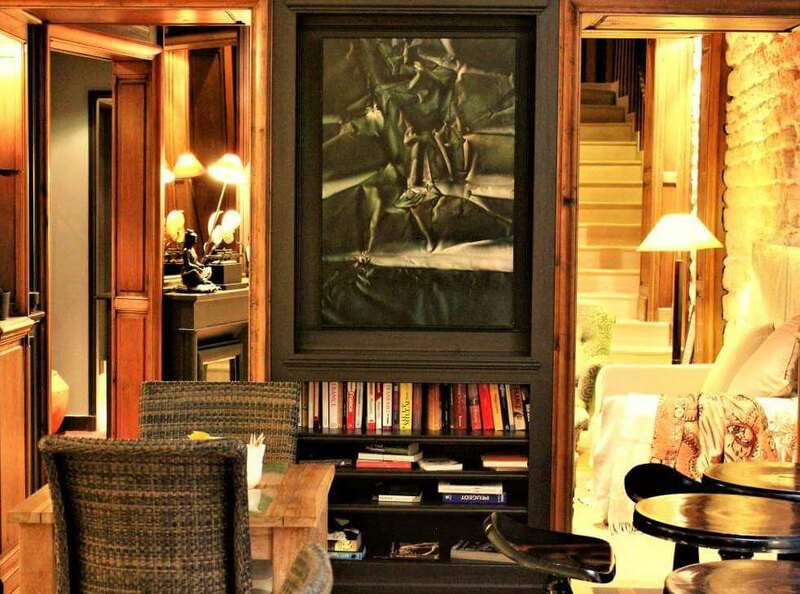 The Hotel Prince de Conti really is in the heart of historical Paris ! By submitting this form you agree that Boutique Hotel Prince de Conti collects and uses the personal data you have entered in this form for the purpose of contacting you and sending you information that you have accepted to receive, in accordance with our policy data protection.